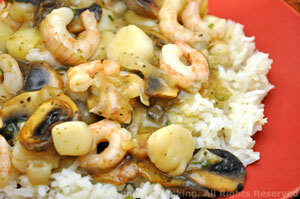 Shrimp and Scallop Newburg, Thyme for Cooking easy gourmet dinner. You could use all shrimp or all scallops for the Newburg, I like a mix. Sometimes simple is best.... Or, at least, as good. Lightly steamed Sprouts, tossed with butter, thyme and salt. Simple, delicious. Put in a steamer basket over an inch of water and steam for 12 - 15 minutes, after water is boiling, or until done. They should be tender when pierced with a sharp knife but do not overcook. When done remove basket and empty water. Return pan to heat and melt butter. Add herbs, salt & pepper. 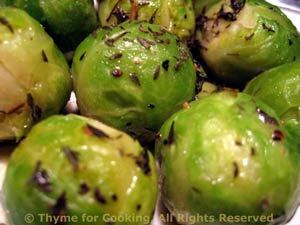 Return sprouts to pan and sauté stirring for 1 - 2 minutes. Serve.